If you came from "Linda- Scrappy Therapy" then you're on the right track! The letter "D" for my project represents the word Dimension. I figured I would play with the Cricut and cut out a 3-D item that has some dimension associated with it. Here is my project. This mailbox is the cutest! My thought process consisted of making something I could use to provide reward and recognition to my daughters. How about some Mommy Mail?? When the arm is up on the mailbox it means mommy has left some mail. I used a brad to allow the arm to move up and down. My oldest daughter loves butterflies so I used them to decorate her mailbox. I used a retired paper packet La Bella Vie. I cut out the mailbox from the CTMH Artiste Cricut Cartridge. I also used it to cut out this cute butterfly. I glittered it up using Glitz Bronze Glitter Gel. I did some distressing of the edges using a sponge and Smokey Plum ink. The title plate was made using the CTMH Art Philosophy Cricut Cartridge. Here are some up close pics of the butterfly. I also made a little card which reads "Believe to Achieve" on the front and I have a hand written note on the inside along with a stamped image which says "You're Amazing". The stamp set used for the inside came from the stamp collection that comes with the Artiste cartridge. The outside stamped sentiment was from a special promotion stamp set from 2012. What a great way to recognize our children in a positive way!! Here is the notecard up close. You can leave little candies, or small objects as well. 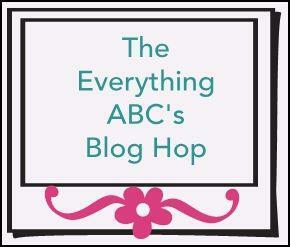 Your next stop on our Everything ABC'S blog Hop is "Shelly Nemitz -Just One Piece". Love the "mommy mail" idea. I'm sure your daughter will love getting mail from you. Love the mailbox! love the mail idea too! I may have to borrow it!